That’s it, the last game of the season has finished, our league position has been finalised, and everyone gets a well-earned bit of time off (well, except for the gaffer, the chairman etc). Thoughts will now turn to the summer, getting the team sorted for next season, and preparing the pitch etc for another year of National League South football. But it’s also a time to look back and reflect on the season that has gone by, to commit the highs and lows to memory and enjoy our successes. We all know what happened over last summer, and things looked like they’d started well as we won our first 2 games of the season (Weston 4-1, Wealdstone 2-1). A downward slide immediately followed with 4 consecutive losses, and although a win came at home to Margate at the end of August, it didn’t halt the slide and the lads next win didn’t come until October 24th at Hemel Hempstead Town. By this time though, after the poor run of league form and getting knocked out of the FA Cup before it really began (at the 2nd Qualifying Round), some player changes had occurred (Jay Dowie joining for example), and our assistant manager Jody Brown left the club and was replaced by the returning Glen Alzapiedi. By the Hemel game it was as if things had finally fallen into place. The Hemel win was one of 8 from the next 10 matches (including the Essex Senior Cup & FA Trophy) which pushed Concord back up the table. Due to a registration issue with loanee Jordan Cox (striker from Braintree), the team were ordered to replay their FA Trophy match against Sutton United, this time with the game at Sutton. This appeared to knock the lads a bit, as they lost on the night in between two away league losses against Havant & Waterlooville and Ebbsfleet. Then the big run hit, the 12 game unbeaten streak started with a draw at home to Bishop’s Stortford on December 28th, and continued until we fell 2-1 at home to St Albans in the middle of March. During this run we overturned both Chelmsford City and Colchester United in the Essex Senior Cup (setting up our third final in as many years), and grabbed a tough 2-1 win away at Dartford. A 5-1 loss away at Oxford City was a reality check before another win over Chelmsford City came in the league. 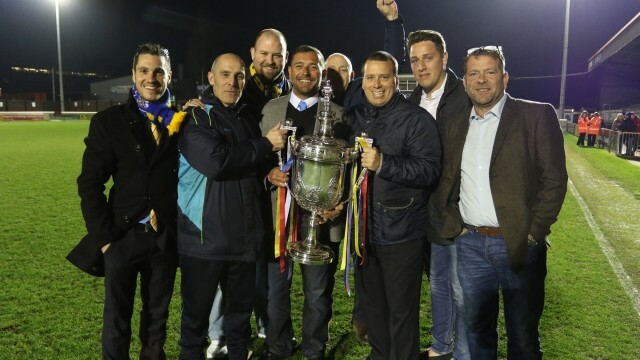 April 12th was the date that history was made, as Concord Rangers beat Heybridge Swifts (where former assistant manager Jody Brown & GK coach Danny Clare were now on the managerial team) by one goal to nil in a very hard-fought Essex Senior Cup final. The Beachboys became the first team since 1967 (the year of Concords birth) to win 3 consecutive Essex Senior Cups, but focus quickly shifted back to the league, as the playoffs were still a possibility. The season essentially ended with a bit of a whimper, as a draw at Hayes & Yeading followed by a loss at home to Truro City on a cold Tuesday night killed off all hopes of extending our season beyond April 30th. A point away at Maidenhead United on the final day of the season rounded things off with a solid result. All in all though it was an eventful season; and a successful one too. We’ve won the Essex Senior Cup for a third time, we’ve established ourselves in this league given all the changes we had last summer, and kept in the hunt for the playoffs until late in the season. It’s been great fun being a part of it, and I look forward to doing it all over again next season!